Ritik Mehta has grown up in a world where it is possible to 3D print your dream designs at home with the help of easy-to-use 3D design software applications such as Tinkercad. Like the other kids of this 3D printing generation he’s taking the first step of many more to move towards a world where people help each other with 3D printed goodness. Lately he has been very engaged in making his own custom glasses. This gave him the idea to provide an opportunity to everybody to own customized glasses and, at the same time, be part of a unique charity to help kids in Africa and Asia see the world as they should. Ritik, a 13-year-old 3D printing enthusiast with a big heart. And just like that with the help of his father, he turned his idea into reality; so if you are in the Antwerp, Belgium area on Saturday December 21st, make sure to stop by Designcenter de Winkelhaak to see Ritik’s vision come to life. Here you will be able to make your own custom glasses from the 3D design to the 3D printed model. Professional designers and 3D printing experts will assist you, and the money made from the event will go straight to ‘Eyes for the World’, an important non-profit foundation which believes that everyone, all over the world, has the right to see well. 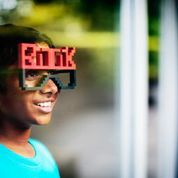 Join us in helping Ritik show that money is no object when it comes to how 3D printing technology can benefit everyone.